It is very hectic in Manipur these days as elections to the 60 seats in the Manipur Legislative Assembly are due to be held tomorrow. For the last week people have been huddled in groups discussing the upcoming vote. 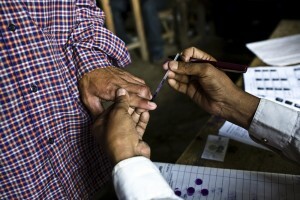 Around 1.74 million voters will be casting their votes to choose the best 60 representatives of their choice from among the 279 who are contesting for the 10th Manipur State Assembly. The culture of elections in the state is of bribery, corruption and proxy voting. When the election time approaches, the candidates distribute a few hundred rupees per person, organise feasts and entertainment programmes, like drama, music or film shows in the locality, and mend a few roads. However, after they are elected they forget that they are representatives of the people and instead of working for the welfare of the people they concentrate on amassing wealth and power. This is the sad thing about the greatest democracy in the world that is India. In concept, democracy is such a wonderful and idealistic thing which our leaders like Mahatma Gandhi and Jawaharlal Nehru must have thought of as the best gift for the people of India. But today in the implementation process, democracy – which is based on people electing their own representatives – has become a farce of money power and muscle power. In Manipur there is yet another discrepancy – that of the lack of political participation of women. 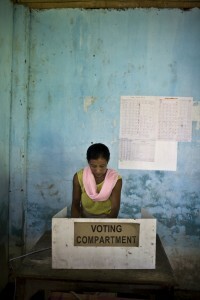 Among the 1.74 million voters in Manipur, there are 850,000 men and 890,000 women voters. So women greatly outnumber the men and hence the deciding factor in the coming elections will be the women electorates. In fact, women voters have outnumbered men since 1990 in Manipur. However, unfortunately they are often misled by the false promises of the candidates. This could be partly due to women’s low level of political participation and lack of awareness and partly due to generations of being unable to make their own decisions. So, what the male head of the family has decided will be followed by the women. On top of that women themselves often mistrust the capability of the women politicians and often do not vote for them. This is a distressing truth and perhaps that is why there are very few women who stand in elections, and fewer still who are elected. In fact since the first assembly polls were held in 1967, there have been only four women Members of the Legislative Assembly (MLAs). All of them were wives or widows of prominent politicians of the state. This includes MLA Okram Landhoni Devi, who is incidentally the wife of present Chief Minister Okram Ibobi Singh. Other former women MLAs were Keisham Apabi Devi, Hamingla Shaiza and Wahengbam Leima Devi. The 2012 Manipur election is significant in this aspect because among the 279 candidates contesting this year, 14 are women candidates. There were just six women candidates in the last assembly polls held in 2007. We have been lobbying with various politicians for the inclusion of women and children issues in their agenda. In fact, prior to the last session of the Manipur Assembly held before the announcement of new elections, we had urged the sitting MLAs to bring up the issue of rising crime against women in the discussions so that an effective solution could be worked out. We were happy that the matter was raised, and duly noted. Now, we must place our hope with the new government that will be elected by the end of this month. In the election manifestoes that have been released by the different political parties so far, there have been some references to the conditions of women. Though the references lack an in-depth understanding of the issue or a concrete strategy, we feel that it is still another step forward even if we are not sure whether this is a result of our lobby work or due to other factors. Our main concern is that whoever is elected, regardless of party lines, they should commit themselves to work for the welfare and protection of women and children from the gun culture and the rising crime in the state.